The 10 Best Neighborhood Bars in West Virginia! One of the best things about a neighborhood bar is the comradery you find there. 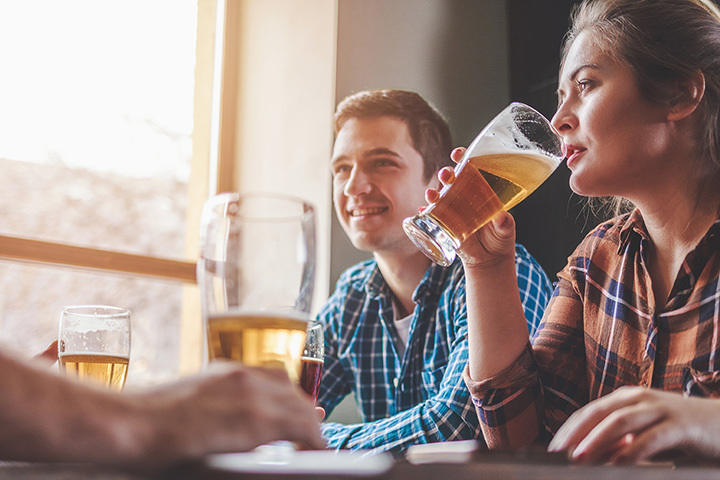 Often a place to stop by after work, or a great place to meet friends or a date for a casual and relaxed evening, these West Virginia bars epitomize the neighborhood bar. For good food, inexpensive drinks, and a comfortable atmosphere, check out our favorites. For over 20 years, Sam’s Uptown Café has been serving the Charleston area with cold beer and great pub grub, live music, free Wi-Fi, and your favorite sports teams on the large screen TVs all around the place. Open every night except Sunday until 3 a.m., Sam’s is the perfect place to chill with friends, relax, and enjoy likeminded people who love sports. The main goal at Sam’s is for everyone to feel welcome. If it’s the grub you come for, you’ll find the best chicken wings around, burgers that satisfy your taste buds, and sandwiches that fill your tummy. This is one of the area’s favorite bars with the best food in town. The casual dining atmosphere at the Station Square Lounge in Nutter Fort, West Virginia, just lends itself to easy conversations with friends, and popular favorites include the grilled chicken salad, pizza, sausage sandwich, and hot dogs. Check the Facebook page for coupons. Located in Wheeling, West Virginia, next to one of the area’s breweries, the Market Vines offers craft beer, great food, and excellent service. With an impressive selection of fries and fried foods like sriracha fries, hot pepper cheese balls, onion petals, and fried green beans, you can follow up with chicken wings, salads, sandwiches, classic burgers, wraps, and entrees that compliment your adult beverage of choice. Open every day, the Market Vines has the brews you want in the comfort of casual surroundings. Mundy’s Place in Morgantown, West Virginia, believes in cold beer and good friends. This popular neighborhood pub takes that belief very seriously by catering to its clientele with extended hours for games and making sure they have your favorite beverage and food. Looking for a place where a smile is offered, the lights are low, and the music good? Mundy’s Place is worth checking out any day of the week. Considered the best bar in the area by social media reviews, Charlie’s Pub in Fayetteville, West Virginia, is that place where everybody knows your name. After a hard day, you can relax, shoot a game of pool, kick back, and have a cold one with old friends or make some new friends. Daily drink specials and special events like live music and Bridge Day celebrations, Charlie’s has wicked awesome pulled pork sandwiches and chili that will satisfy the hardiest appetite. Known as a college bar, the Irish Pub is that and so much more. Located in Lewisburg, West Virginia, this Irish pub has a small but good menu featuring great food like Irish stew and corned beef on rye, and their beer, whiskey, wine, and house cocktail list is unparalleled. With a little inspiration from New Orleans, they even have a red beans and rice dish that can be served vegetarian or vegan. When you combine all this with a great atmosphere, daily drink specials, and lively music, the only result is success. Known as the bar where friends and family come together, Route 60 American Grill and Bar is about as American as you get. Located in White Sulphur Springs, West Virginia, this local bar has been around since 2001 and serves food 7 days a week. Visitors must be at least 21 years old with ID, but younger patrons are welcome on the restaurant side. Besides your favorite food and drink, you can enjoy a game of pool, play one of the give slot machines there, watch your favorite team on the large screen TVs, and listen to your favorite tune on the juke box. One of the things that makes the West Virginia special is the laid-back quality of life in the mountains. Thomas, West Virginia, is right in the heart of the mountains and is a prime example of this casual and unpretentious attitude and it’s reflected at Mountain State Brewing Company. The Mountain State Brewing Company is one of the largest and oldest microbreweries in the state. As they say on their website, it’s like drinking beer with your best friend. Featuring a nice selection of beer, Smokin’ Jacks offer game day specials and other discounts during the week. Best wings around and a whiskey barbecue sauce that will make you lick your lips. Open every day from 10:30 a.m. until 10 p.m., everyone is welcome to come and hang out. Open from 2 p.m. to 2 a.m. daily, Sixpence Pub and Eatery in Parkersburg, West Virginia, is a great place to meet friends and enjoy an evening of relaxation, entertainment, and fun. Daily food and drink specials, live music, and open mic night every Wednesday. Join friends and family and have a steak and cheese fries, chicken wings, or some of the best barbecue ribs in the area.